I was following Tom Menezes, farmer and co-owner of Hawaiian Crown Chocolates, around a hilltop field north of Hilo, Hawaii. He was showing us his cacao orchard and explaining how he makes chocolate from beans that he grows himself. You’ve probably heard of the Big Island’s most famous culinary export, Kona coffee, but did you know that Hawaiian farmers also grow and make chocolate? 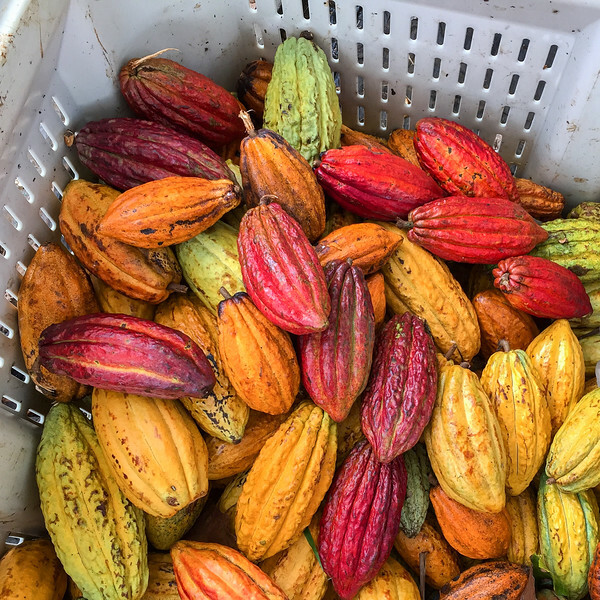 When I told her we were going to Hawaii, Sunita de Tourreil, the owner of Palo Alto’s Chocolate Garage put me in touch with Tom, “he’s the best cacao farmer in the state!” I sent him an email and he agreed to show us how cacao is grown and how chocolate is made. 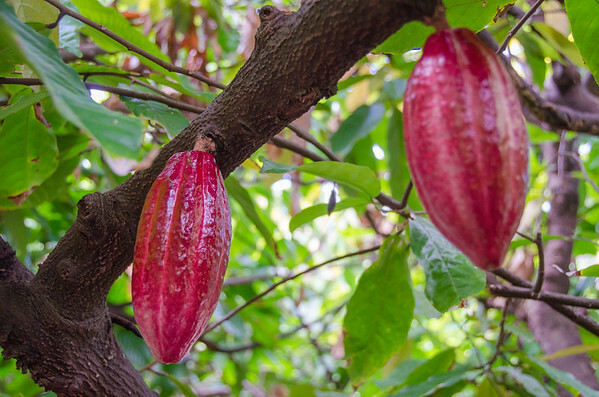 Chocolate 101: Did you know that chocolate comes from a fruit? Cacao (or “cocoa”) is a football-shaped fruit pod. The seeds (also called “cocoa beans”) and sugary pulp are fermented for several days before drying, roasting, and cooking it down into the chocolate we know and love. Tom Menezes takes this one step further. He’s a “tree-to-bar” maker–a cacao farmer who does everything from growing the fruit to crafting the final product. He grew up on the island of Oahu and studied agriculture at the University of Hawaii. 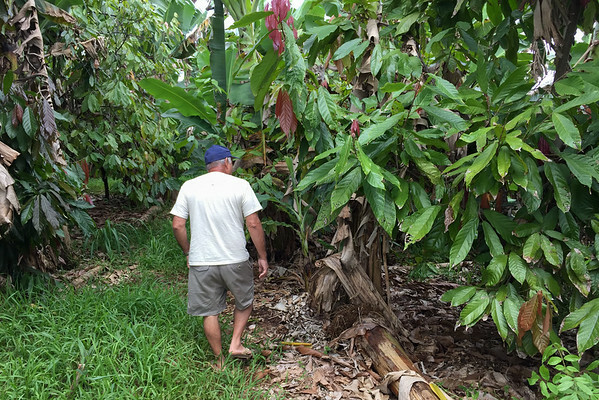 He’s been farming in Hawaii for over 35 years, was one of the first cacao growers in the state. He’s a respected agricultural scientist and considered a leading authority on Hawaiian cacao farming. His chocolate is in high demand–a recent agricultural survey concluded that his cacao had the highest percentage of naturally occurring cocoa butter of any grower in Hawaii. 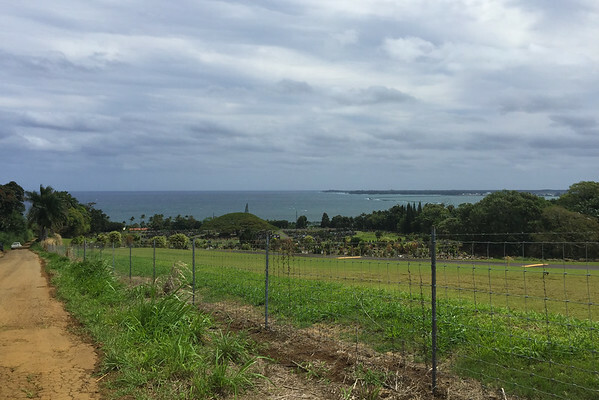 This hilltop field was one of three parcels that Tom farms on the island. 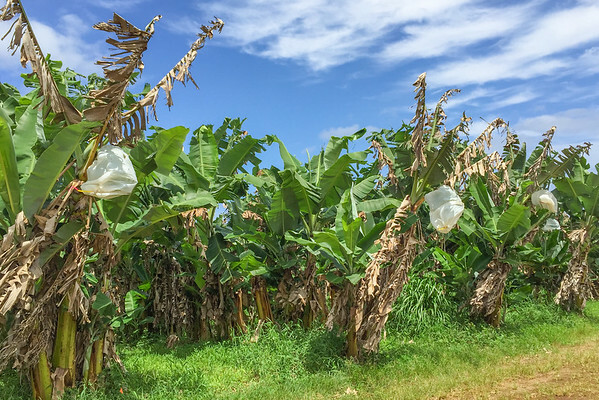 The east/Hilo side of the Big Island is rainy and wet, and Cacao fruit is not a fan of the misty breezes, so Menezes grows his cacao under taller banana trees to shield them from the elements. He’s currently transitioning his orchards over to organic, a process that takes a few years. In addition to cacao and bananas, he grows pineapple and taro. 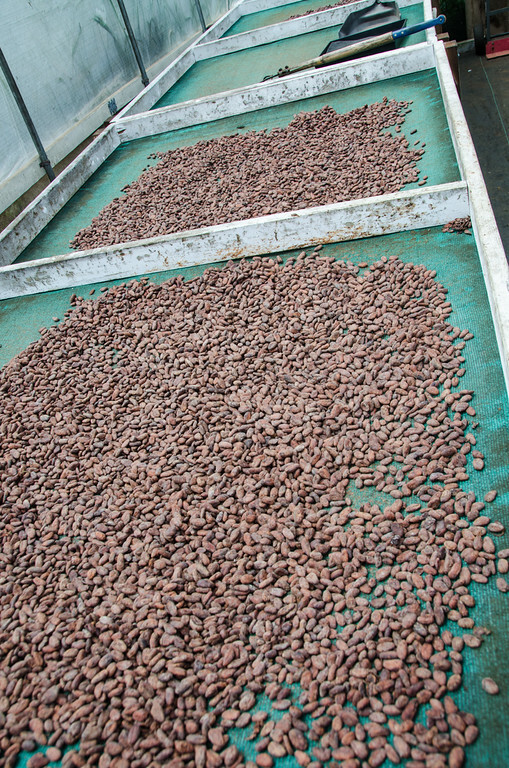 Cacao is harvested from October to March. On the day we met up with Tom, he was in the middle of fermenting a batch of cocoa beans. It was a surprisingly low-tech process. He raised the lid of a 120 quart plastic Igloo Cooler to reveal a funky, white mash of beans. The pungent smell told us it was fermenting! 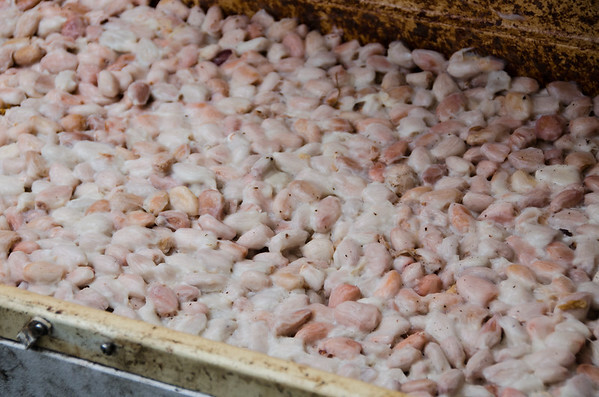 After fermentation, the beans are cleaned and then spread out to dry in the sun. When they reach only 7% moisture–Tom can tell when they are ready just by touching the beans–they bag them up and store them for roasting. 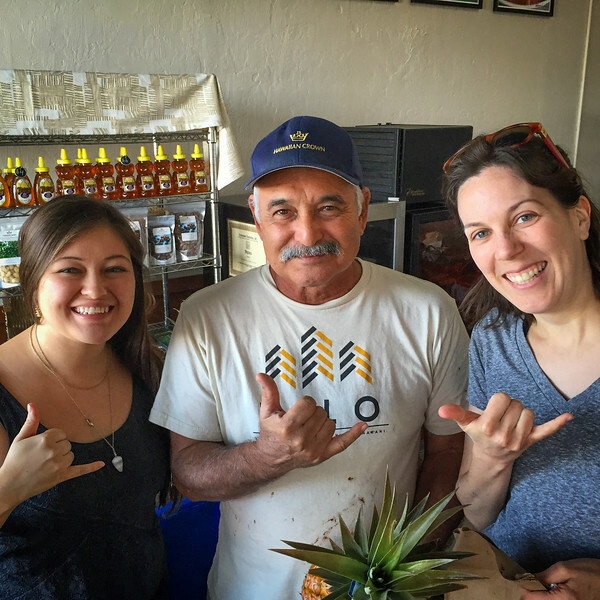 After we walked around the small plot of land, we met Tom back at the Hawaiian Crown Store & Cafe in downtown Hilo. It’s a small storefront that he opened back in 2014. His team does all their chocolate production in-house (we could smell a batch of cocoa beans roasting when we walked in the door), and they also have a full cafe menu with hot chocolate, coffee, fruit smoothies, acai bowls, and sandwiches. We agreed to join Tom for lunch. 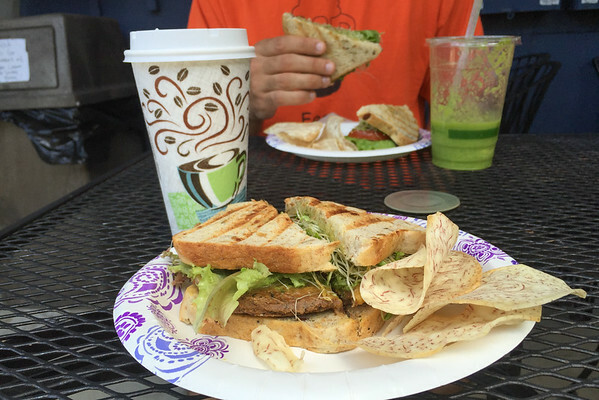 He was demo-ing a new vegetarian-friendly menu item that he wanted me to try… a Taro Burger! If you’ve ever had the notoriously bland, purplish-grey Hawaiian food staple “poi,” you’ll know taro. It’s a starchy root vegetable similar to a potato. I was curious how this would work in burger form, but I was pleasantly surprised. Tom’s homemade taro burger patties were seasoned well and had great texture–soft but firm and a little crisp on the outside. He served it with a side of taro chips which showed off the fruit’s marbled colors. It was a creative option and one of the best veggie burgers I’ve ever had. After lunch, and blowing our travel budget on Hawaiian Crown chocolate bars and chocolate covered macadamia nuts, we said goodbye to Tom (and his daughter, Oona) Hawaiian-style. 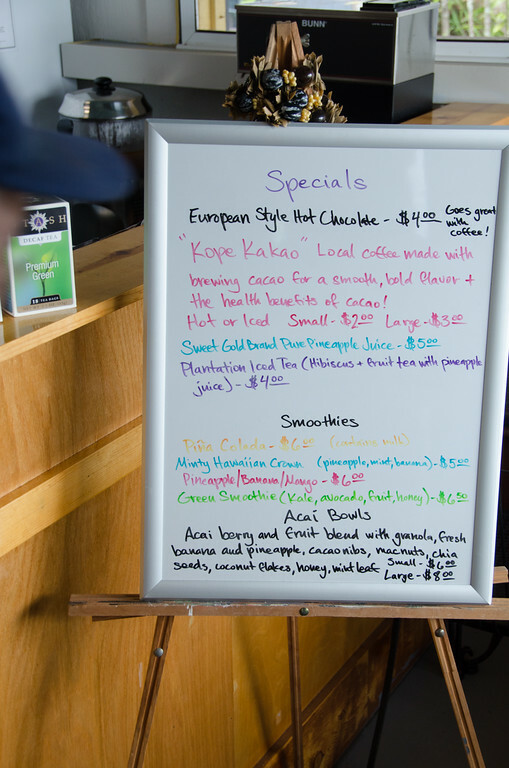 If you are visiting the Big Island, you can visit the Hawaiian Crown Store & Cafe (160 Kilauea Ave) in downtown Hilo. You can also find Hawaiian Crown’s chocolate at Foodland and Whole Foods grocery stores around Hawaii. On the island of Oahu, Tom’s co-owner runs a Hawaiian Crown store in Honolulu (159 Kaiulani Ave. Suite 105). On the Kona side of the island, the Original Hawaiian Chocolate Factory offers cacao farm tours by appointment. Interesting post. How big are those beans before they are dry? They look quite chunky on the photos, but maybe it’s just an effect from the distance and the lens used. Yes, that photo gave me a better idea, thanks. It’s quite crazy how we often don’t know what things look like before being processed, even if we eat them regularly. Agreed! I love learning about what’s behind the food that we eat. It’s so easy to take it all for granted! Haven’t yet been to Hawaii but definitely plan on it in the near future. My husband would love to try different coffees (I don’t drink coffee) but I would love to try the chocolate! Very cool! Chocolate is also a big industry in Brazil, and I’ve eaten the fruit there. I do hope this farm starts doing farm tours because I think it’s such a nice way for tourists to get to know the local industry and understand much more about indigenous crops. A small correction…I’m not sure if this is actually actually an indigenous crop, but I guess I meant crops that are important to the local culture. Agreed! I told him that culinary tourism is booming and more travelers are looking for these kinds of things. He mentioned the regulation that is involved (USDA? Or state ag. department?) Bringing tourists on site adds the risk of introducing new pollens and disease. But if they can manage a program like some other farms have, I think farm tours are a good source of added revenue. Glad you’ve tried it in Brazil! It’s a surprising flavor, right? Dandelion Chocolate in SF sells cacao fruit smoothies and I know they import frozen fruit puree from Brazil. You know what else we found that day–that purple berry that grows on tree trunks in Brazil! I know you’ve shared photos of it — jocobacoba, or something like that? There’s another word they use for it there. I found it fresh at a natural food store and tried it kombucha. Cool! The fruit that grows on the bark is called jabuticaba. I have never heard of it outside Brazil, so that is cool that you saw it! 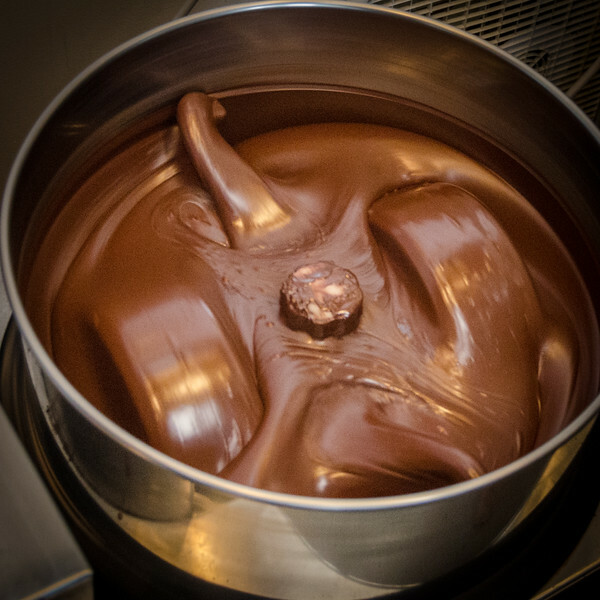 Hawaii is a great place to explore chocolate. We didn’t make it over to Hilo, but I have tried all the offerings of Big Island Candies from Hilo and they are magnificent. I shall have to introduce myself to Tom. Thx for the great post.